Provides hair with more volume. 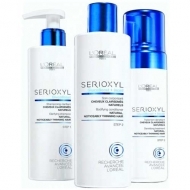 DESCRIPTION: SERIOXYL Kit 2 Coloured Thinning Hair from L'Oréal Professionel is a kit to optimize the effects of serums densification Serioxyl of L'Oréal Professionnel, getting instant results in combating the loss of capillary density, L'Oréal Advanced Research has developed an absolutely innovative program: the Serioxyl Kit 2. Ideal for fine hair with color, this comprehensive program that fights the loss of capillary density is to be performed at home. 5 -In case of contact with eyes, rinse them immediately.